One of the best ways to fight stigma is by telling our stories and earlier this week, I mentioned that Colorado Springs novelist and award winning NAMI advocate, Kathy Brandt, and her son, Max Maddox, had written an especially well-crafted and poignant memoir entitled Walks On The Margins. She gives the parental viewpoint and Max writes as an individual dealing with the symptoms of bipolar disorder. On Monday, I published two excerpts from their book written by Kathy about her relationship with NAMI [National Alliance on Mental Illness.] Now I am posting two excerpts from the book written by Max. The first describes his thoughts when he was first hospitalized. “The first excerpt was only one day after I had been diagnosed at that hospital. I was still very manic at the time. Being my first episode, I was fully unaware of the division of two realities that had taken shape (I had yet to internalize any idea of insanity, a virgin as I was, it was only reality itself that had transformed). It wouldn’t be long now. Soon enough my folks, sisters, pharmacists, not long the government, the United Nations…What design! What intricate design! Was I the first? No, no. Just another beacon of the message. I tried to explain this to an old lady in a wheelchair while we watched Guiding Light. She suffered from nothing more than anxiety at the precipice of the after-life. We were not so different! On the escalator we held hands. And of course my parents were right on time; they’d had their own long trip. They looked to me for answers, answers which only led to more questions, their eyes falling on me as they never had before. They were an audience in wait. Dare I say it, they were in awe, watching my performance with fantastic enchantment, simply astonished. I spoke to them my art-politico, refolded my unifying theories from thin air, relaying the news, insisting it was right there in the music, trickling from the old nuthouse radio. Even the doctors and their personnel seemed complicit in the plan. And, indeed, by them no accusations of wishful thinking were necessary. When all is said and done, everything takes care of itself in the emporium of perfumes. If it don’t have a brand, it don’t have a flavor: Christian Dior, Elizabeth Taylor. A spray for you, a spray for me, a spray for the nurses bored watching TV. The overactive and the underactive opened wide their mouths, in rainbow colors we pinched our paper cups. At the front of the line, the meth-head like a monkey waited on his treat, pulling up the rear, the acute psychotic stood dithering with his tongue stricken stiff. Now now, there there, another dose put him back to sleep. So his saliva fell, seeping through the perforated corridors of his foam pillow, the same piece of bread as the last tenant in 12B. Even if we can benefit from the often-harsh regimen of vitamins thrust upon us, the question of whether the mesh surrounding the mentally ill protects the sufferers themselves, or only serves to sanctify the general public and their habits, has the most ambiguous answer. So when the afflicted are offered helping hands, the intentions of their purveyors are in constant need of scrutiny. Half the time paranoid to begin with, a ‘consumer’ might wonder if he can trust anyone at all. The jury is out. Clutching reason like a privilege, and deemed unable to bear witness to ourselves, the case is dismissed, we hope, as we have no defense in the prisons to which we are destined. It’s unfair but it’s much more than that. They can take everything. Now I want to know what’s needed to live a long and prosperous life. A free life, a life from which I leave knowing the truth about myself. One where I don’t die at the hand of a stranger, especially if that stranger is me. A professional artist, Max has an undergraduate college degree in philosophy and a masters degree in art. He is recently married to a fellow painter and writer, Maria. Rather than going the traditional publishing route, Kathy and Max, chose to publish their memoir on their own — although they did seek help from a New York editor. More and more writers are producing e-books or self-publishing. 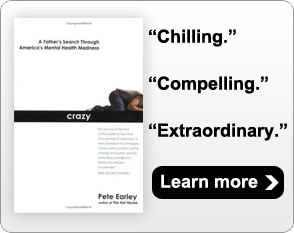 If you have written a book about mental illness that you want to publicize or have read one that has been especially helpful and wish to recommend it, please write a comment.